"This anime is worth experiencing for the stunning visuals" is a statement of praise that also usually means corners were cut in other important areas (plot, characters, etc.). Thankfully, the visuals here are backed up by an interesting story. In a world where humanity lived under the sea before adapting to live on land, four students still living underwater must now adapt to their new school on land. This setup allows the anime to explore themes of cultural conflict and (surprisingly) climate change. The main focus, however, is clearly on relationships and that's where things take a turn for the melodramatic. For better and worse, everyone seems to be in unrequited love with someone else and none of these are resolved until the final few episodes of the series. After a while it drags a bit, but these scenes on their own don't often overstay their welcome and the show's other strengths more than make up for it. Contrary to what the "dub haters" will claim, this dub is perfectly fine. In an era of consistently good dubs (what you feel to be voice miscasting isn't the same thing as bad voice acting) this is well on par. You may have issue if you've already spent extensive time with the original Japanese voices, but where else are you going to hear Chris "Kirbopher" Niosi as a sea deity? As a final note, this series is cleanly split into two 13-episode arcs, so I'd recommend keeping that in mind if you decide to marathon. My favourite anime of all time! It's so beautiful, the love stories in this anime are intense but it's so intense that you're having a hard time deciding who is more perfect than the other. The scenery and backgrounds are so well done I can't stop myself from re-watching this anime! , and how they can behave so right in the beginning of the season can't be seen or induced though the season has ended. The anime does a good job with insight into human minds and how sudden change affects them, but the initial case on which all induced cases are based is weak, degrading such effects. There are also some common pitfalls that happen when the staff did not do enough basic research on materials used. Still, if one ignores the weak basis, the plot has vibration and is complex. Character emotions are depicted. The pace is good, neither too slow nor rushed. It also successfully reached its final peak near the end, which makes the experience of watching the final episodes tense and exciting. 1st of all I just want to say the atmosphere of this anime is one of the best of all the 1000+ anime I have watched; great music, stunning visuals, and a fairly normal but perfect setting for this show. If you have seen Glasslip, and enjoyed that or were even slightly entertained by it, I would say this is the much better version of it. A Lull in the Sea start off kind of slow (like most romances), but gets very intricate and dramatic after a few episodes. In terms of pacing of the show, I feel like everything was paced at a great pace, some people may disagree and say it was a bit to slow but the fact that they took the time to really show us more about the characters and the life they live and challenge they face is what makes this such a memorable anime. Anyone who has watched and enjoyed; Clannad, Air, Angel Beats, Little Busters!, Ano-hana, and anime of that type.... THIS IS A MUST WATCH !!! Well that is my review of it now go and watch it!! I can honestly say this is now one of my favorites, the way the show handles romance is believable and adult with how it treats its characters. No one feels like just a stereotype and they all are lovable and interesting. The animation is gorgeous and the music is calming like the sea itself. I listened to the dub and found the performances to be really great and not too overstated or stiff sounding, it was all perfectly natural. So do yourself a favor and check out this show and and let the wave of emotion take you on a ride. This show is so beautiful, not only that I was hooked from the very first episode. The story was more dramatic and had more twists than I was expecting which was a pleasant surprise! The artwork and story are top class, this is easily in my top 3 anime! Love Triangles are my guilty pleasure in anime and this anime serves it up with heaping helping of beautiful visuals and deep characters. The characters are deeper than paper thin cliches with complex feelings for each other. Yes, this can be described as a love polygon. She loves him, but he loves another, all the while another guy is in love with her and so on and so on, but it's nothing confusing or annoying. The characters are genuine in their feelings. Halfway through the series, there is a huge shift in the status quo and relationships get tossed about, bringing fresh changes. A theme of this anime is the fear of change and accepting change. There are also themes of racism between the sea and land people. There is little to no violence and very minor fan service. The anime is beautiful with lovely underwater visuals and I just LOVE the character eyes. The dubbing is good. Not the best, but I have heard far, far worse. 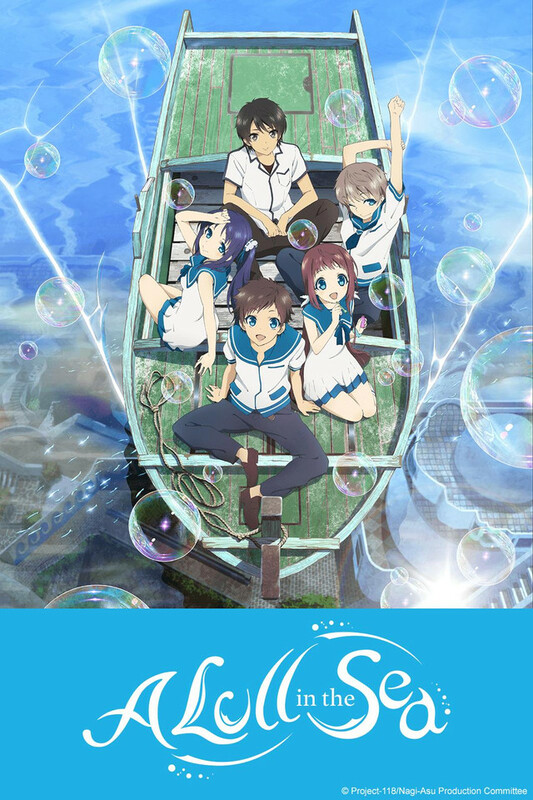 Great visuals decent story but not entirely what I thought this anime would be it should have focused more on the sea people and land people interaction and not so much on the romantic angle which was alright but a bit too much at times you know the old I love him and he loves her but of course it's not the person their thinking of most of time. The sea people are about to go into hibernation and all that melodrama starts playing itself out and the last couple episodes kind of straighten all that out so it did have a satisfactory ending. Wasn't any fan service to speak of its not bad would give it a mild recommendation. This anime has a really good dub thanks for that CR.